Please use this link to access Nutrislice, our dining services website. Applications for the 2018-19 school year are available. A new application is needed EVERY YEAR for all students, one per family with all students names. Previous year's application is still in affect 30 business days of the new school year. Account balances are on PowerSchool. *The "e-Funds For Schools" electronic payment service is provided to the school by a third party service provider. The service provider has a nominal fee for their service. There is a $1.00 transaction convenience fee for each electronic checking payment that you make. The system carries a Non-Sufficient Funds (NSF) charge if the payment is “bad”. For payments made by credit or debit card, there is a transaction convenience fee of $2.65. For example, a credit card charge of $101-$200 would cost $5.30 and so on. When you set up your account, please review your options carefully. You are in full control of your account and can make a payment at any time that is convenient for you. No payments will be allowed without your knowledge and authorization through this secure payment system. By providing your home and/or work email address, an email notification informing you of the student’s name, purpose of the payment, and the amount of the item will be sent to you each time that a payment is to be processed. 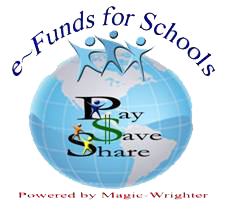 The e-Funds For School site is secure and uses industry standard data encryption. The program offers various types of payment options to families for food service payments. The system may be expanded to include other fees as well. If your student needs a lunch for a field trip that Lake Shore’s food service can provide that service. If your child receives free or reduced lunch, they will receive that benefit for this lunch too! Please let your student’s teacher know in advance if your student will need a sack lunch for their field trip and we will have it delivered to them!